My name is David Sewell, Founder and CEO of AgroNosotros (AgN). I am pleased that you have taken the time to learn about Agronosotros and our Farmland Ownership opportunities. You are invited to “get the whole story” by reviewing our International Coffee Farms (ICFC) website www.internationalcoffeefarms.com and our Belize Cacao Consortium website www.peinicacaoplantation.com to learn more about our unique business model. 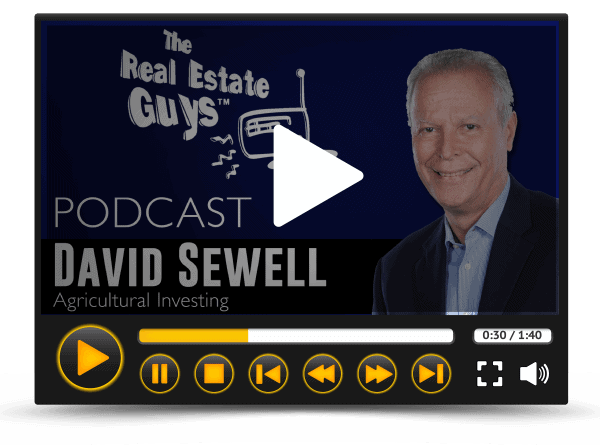 Listen to our founder, David Sewell, talk about Agricultural Investing as a Profitable Niche with host Robert Helms. 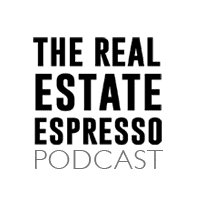 International Coffee Farms is the proud sponsor of The Real Estate Espresso Podcast by Victor Menacsce. 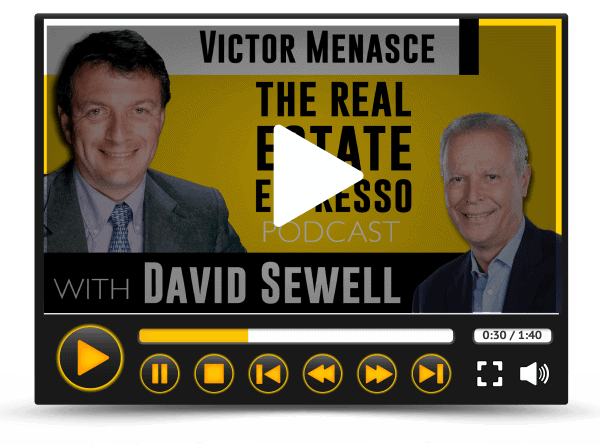 Click the image to listen to an episode with our founder, David Sewell, as Victor’s guest. AgroNosotros (AgN) is a pioneering effort to vertically integrate the specialty coffee and fine flavor cacao industries, beginning with ICFC in Panama in 2014 and BCC in Belize in 2016. The business model is to acquire under-performing, under-capitalized, commercial coffee and cacao farms, and suitable raw land, in areas surrounding Boquete, Panama and in the Toledo District of Belize and turn those farms/raw land into very productive specialty coffee and cacao farms, over a 3-year period. AgroNosotros currently operates 11 specialty coffee farms and 5 fine flavor cacao farms. Once acquired, depending on the farm itself, a specific plan is put in place to repurpose the farm by adding capital and know-how (coffee or cacao science) to fully develop the farm and get it operating to its maximum potential. Shade crops will be managed, water systems implemented, and soil and leaf improvements conducted. Old trees that are past their peak will be cut down and replaced by saplings of new, healthier, more in-demand varietals from our own nurseries. And the coffee and cacao will be processed and analyzed for quality in state-of-the-art, on-site wet & dry processing plants and proprietary laboratories. When implemented, these plans need time to mature…. to “harvest” the extra rewards. These extra rewards will provide increased profits in the form of increased coffee and cacao quantity, higher quality and higher sales prices. A key part of the business model is to be able to supply micro-lots of single-origin, traceable, specialty coffee and fine flavor cacao worldwide to buyers of these in-demand specialty products. When acquired, the farms will usually be growing and selling some, usually substandard, coffee or cacao. The business model intends to continue the operations with new and modern management practices to generate near-term income within 15-18 months and to develop an increased and sustainable annual income from these farms that will last for many years. What is the opportunity for you? In summary, it is a low-risk real estate based agro-investment, with a sustainable and conservatively projected passive income for many years to come, with a potential for capital gains in the value of the land. 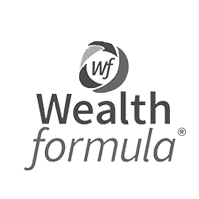 AND importantly, it is a socially sustainable opportunity for you to help provide a good honest working career, with regularly paid living wages including education, medical, pension and accommodation benefits, for very poor coffee farm workers and their families in Panama and Belize. You should not consider owning parcels in an agricultural opportunity, such as AgroNosotros, unless you intend to hold for a minimum of 5-7 years and preferably much longer. Nature takes time to work her Magic! And any shorter period of time may result in you not realizing the financial results anticipated. The business model does not contemplate an exit strategy. 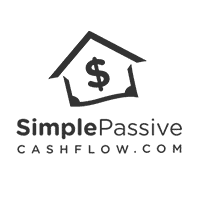 It has been designed to provide a sustainable passive annual and legacy income for the current and future family members of farm parcel owners. There is a minimum contractual hold period of 3 years. This is to allow at least some of the value-added improvements on the farms to affect your parcel value. However, even though the intent is a long-term hold, opportunities may exist for individual parcel owners to sell their property after 3 years, should the need arise. Why is this a superior real estate ownership opportunity? First, many seasoned investors strongly believe that long-term ownership of land has proven to be the most reliable and traditional path to significant gains in wealth over many generations of the world’s wealthiest families. 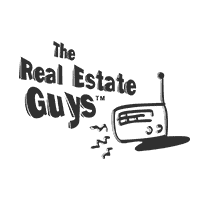 As the world-famous “self-made man” Will Rogers once said, “Buy land. They ain’t making any more of the stuff.” We at AgroNosotros think that is sage advice! Second, the retention of income-producing land over long periods of time, along with the careful and constant management of the land to improve crop yield and quality, has proven to add to the wealth-generating benefits of long-term agricultural land ownership. We think that is the ultimate “buy and hold” strategy! Third, with an ever increasing global population and more and more mouths to feed, accompanied by the decreasing availability of arable land, agricultural real estate is in ever increasing demand. Fourth, if the agricultural land produces a non-perishable, truly specialty crop that is in high and increasing demand, with proven channels to market for those crops already in-place, and with sustainable high profit margins consistently available, we believe a high-probability formula for success is assured. That perfectly describes the economics of coffee and cacao, in our opinion! How do these land ownership concepts relate to Agronosotros? A basic price and market has always been available for coffee and cacao. Coffee is a $40 billion market in the United States alone ($90 billion worldwide), with specialty coffee demand growing at an astounding annual rate of at least 20%. Cacao, when considered collectively as chocolate, is also a $90-$100 billion industry worldwide. Chocolate in all forms, and especially specialty artisanal chocolate, has enjoyed a recent resurgence in demand internationally and this demand is also growing steadily. Should these trends only continue, even without taking into consideration the current relentless increase in the popularity of “all things coffee and chocolate”, the demand for specialty coffee and cacao in the United States alone may double every 3 years, making a 20-year or more plan to own parcels of specialty coffee and fine flavor cacao producing farms an incredibly attractive real estate ownership opportunity. Further, AgroNosotros’ focus on the rapidly increasing worldwide demand for specialty coffee and fine flavor cacao is a low-risk business strategy. If at any time in the future should demand for high-quality and specialty coffee and/or cacao decrease, all the production can be immediately sold on the international commercial coffee and cacao market, as a commodity offering. Doing so may not obtain the incremental specialty premium desired, but will certainly eliminate any downside financial risk of producing a crop that can’t be sold. Adding to the reliability of any income associated with owning coffee and cacao producing land is AgroNosotros’ business strategy of pooling all revenues and expenses from an individual farm’s operations. This pooling strategy mitigates the impact on earnings on any individual parcel from lower or no crop yield and poor crop quality. This could occur due to such factors as the age of the trees on any particular parcel, the replanting of a particular area of the farm and specific parcel-related weather and pestilence issues. And finally….always remember YOU OWN THE LAND! Which would make Will Rogers “real happy” to know! A real hard asset, offshore, safe, secure, private and dependable. What is the projected return and how will it be paid? A financial goal of the business model is to return annually at least an amount that compensates for the business risk of the opportunity plus a percentage above that return to compensate for the time-value-of-money. 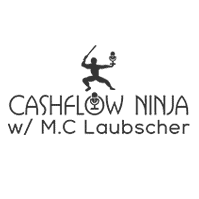 Currently, based on a 20-year discounted cash flow model, the projected net IRR is 9-11%. This return may include a projected future value for the land, which may be substantial over time. This future speculative land value is what results in a range of 2 points in the projected IRR. From Wikipedia…”the internal rate of return (IRR) is a rate of return used in capital budgeting to measure and compare the profitability of an investment…it is an indicator of the efficiency, quality or yield of an investment…the IRR is also called the effective interest rate (edited for brevity). The target IRR is based on a distribution to parcel owners of 64% of the net earnings pool derived from each farm’s net operating profits. 20% of farm operating net revenues will first be allocated to the direct farm operating personnel as a socially sustainable pool. Executive, financial, managerial and sales personnel involved will be collectively allocated 16% of the net earnings pool as compensation for their services. Distributions will be made annually, depending on the actual harvest season and the timing of the sale of the coffee and cacao produced from each farm. Coffee harvest season in Panama runs from October to May depending on altitude. Coffee that has been properly processed and rested after harvest usually is available for delivery in August or September of each year. Fine flavor cacao generally follows similar timing. Harvest usually begins in December, peaks in April/May and may either stop shortly thereafter, or continue on almost throughout the year. The cacao harvest duration is very dependent on the weather, and has been trending towards at least a 9-month season ending in September, over the last few years. Reporting will occur semi-annually, every 6 calendar months. Semi-annual reports will include operations information and the annual “harvest” report will include both operations information and financial results. 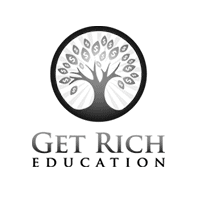 Accounting will be performed and reported internally under GAAP or similar guidelines. Audited financial information will not be prepared or provided. Our 3 pillars of sustainability. AgroNosotros is “Sustainable Income from Offshore Specialty Agriculture”. Our mission is to own and operate specialty coffee and cacao farms in Panama, Belize and elsewhere that are Economically, Environmentally and Socially Sustainable. Our slogan is “Grow It Globally”. Sustainability is the cornerstone of our business model. It is not just a buzz word thrown around or a marketing tool. We believe that with these 3 pillars of Sustainability we can produce amazing specialty coffee and cacao that in turn provides a great living for our team and a handsome return for our parcel Owners. As a key part of our business model we take a full 20% of the gross operating profit from each farm and place it into a bonus pool. This pool is currently being used to provide vastly improved living conditions for our workers and their families. Basics that we take for granted like electricity, running water, flushing toilets, showers and gas stoves are provided. Amenities that most have not had any access to throughout their lives. We provide increased salaries and performance related bonuses as well as paying 100% of their Social Security, which provides medical, pension and dental benefits that very few farm workers receive. We have also facilitated those children and adults who wish to attend school, to do so. In 2016 in Panama, 9 children took us up on our offer. In 2017 we had 21, which included 3 Mom’s who actually went back to school! Why? Because their men are working steadily, with well-paid and reliable jobs, their kids are fed and housed properly and they can relax a little…and look after themselves a bit, for a change. Important stuff! In 2018 the number of children and young adults returning to school as a result of our program went up to 61 individuals! That is 56 children and 4 young adults. We have our own in-house agronomist and a value chain analyst/biologist and we are constantly studying and evaluating the eco-system within each of our farms. We operate a “closed loop” coffee mill and processing system in Panama where nothing on the farm goes to waste. Virtually no toxic elements get into the environment from our mill. The cherry pulp that is removed during processing is used to create fertilizer and compost, with the help of the California Red Earthworms in our pulp patio. The resulting liquid food is sprayed directly onto each and every tree individually during the harsh dry season to protect them and keep them healthy and nourished. Even the parchment that is removed from the coffee bean during peeling prior to export is used to fuel the furnace that dries the coffee. In Belize, we have continued the organically grown traditional methods for cacao production and have built our own proprietary fermentation and drying depot with a capacity to process and store 60 tons of cacao annually. As a measure of relevance, 60 tons is about the amount of cacao produced by Belize in 2015/2016! Obviously we need to be Economically Sustainable because if the farms don’t make money, we cannot implement any of the social practices discussed above. This often means working smarter not harder. Using modern farming practices and machinery , having our own coffee processing plant and cacao depot to produce micro lots of single-origin, traceable specialty coffee and cacao, that sells for 2 – 5 - 10 even 50 times the commercial rate, are a few of the ways our capital investments improve the economic viability of our operations. Buying input materials in bulk as the farm portfolio increases in size, managing our farm personnel over the entire portfolio, cost-saving measures in the processing mill and a plethora of other small things, when added together result in the economies of scale required in a financially well-run operation. We encourage all of you to come to Panama and Belize on one of our group farm parcel ownership discovery tours. The tours scheduled for the balance of 2017 and 2018 are on the individual coffee and cacao websites. Come and spend 4 days in “Panama Paradise” getting to know us and our whole team, walk the farms, learn what is involved in the whole process from seed all the way to green coffee bean and enjoy the best cup of coffee you have ever had. You will get to see specialty coffee professionally processed, cupped, scored and evaluated. You can even try your hand at it yourself! For more information check out the Farm Tour section on our websites www.internationalcoffeefarms.com and www.belizecacaoconsortium.com. Some words from parcel Owners who have made the journey to Panama and Belize to spend time with us on the farms. “I thoroughly enjoyed my time with the team in Belize. Not only did I learn a lot about the chocolate-making process, but I met some truly great people, including other like-minded real estate investors. I left for the trip solo; I came back from the trip with many new friends. My advice to others: go, you’ll be glad you did! The information provided here is for general information purposes only and is not intended as a solicitation to buy or sell securities as defined by the United States of America Securities and Exchange Commission. The qualification process includes the submission of an Ownership Suitability Questionnaire available HERE. The interests represented hereby have not been registered under the Securities Act of 1933, as amended. The interests are being offered and sold under the exemption provided by Section 4A(2) of the Securities Act and pursuant to Rule 506(c) thereunder. If qualified, the applicant will be provided online the appropriate Frequently Asked Questions brochure(s), a 3-part email explaining the basic details of the opportunity and an NDA document which the applicant will be required to submit to the Company. Upon receipt of the executed NDA, a password will be issued to the prospective qualified applicant allowing access online to the proprietary and confidential offering documents including a Private Placement Memorandum, Parcel Purchase Agreement, Parcel Ownership and Management Agreement and proforma financial information. Subsequently, the Applicant will be contacted by the Company via telephone. All applicants are required to independently perform any and all such due diligence as he/she may require to make an informed coffee and/or cacao farm parcel ownership decision. This due diligence may include physical farm visits in Panama and/or Belize, either privately or as part of a scheduled group tour, as described below.